For the first time in Vietnam, students from universities and colleges across the country will have the chance to compete in an animated flashmob dance competition, entitled “Wave of youth”. A flashmob dance performance by Vietnamese students. 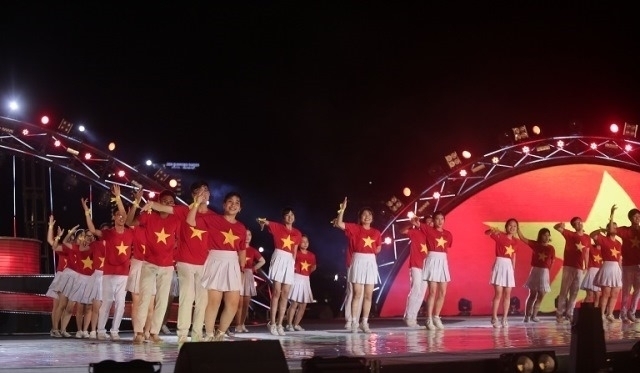 The contest is being jointly held by the Vietnam Students’ Association (VSA), Vietnam Television (VTV) and the organising committee of the 2019 Da Nang International Firework Festival (DIFF), as part of the activities accompanying the DIFF in the central coastal city of Da Nang from June 1 to July 6. The flashmob competition begins on April 1 and concludes on June 27, featuring a preliminary round, the semifinals and finals. It is open for student flashmob dance groups from throughout Vietnam, with each group consisting of at least 30 members and up to 60 members maximum. In the preliminary round from April 1 to 22, the teams should register for the contest in the form of sending their video entries to the organising committee at the email address cuocthiflashmob2019@gmail.com, via the website http://www.diff.vn/cuocthiflashmob or directly at the office of the VSA Central Committee (64, Ba Trieu St, Hoan Kiem district, Hanoi). Submissions should be videos of flashmob dance performances with selected music backgrounds at a length of 3-5 minutes, published and shared on GoogleDrive or burnt onto DVD. All of the video entries will be published on the fanpage www.fb.com/diff.vn/ for online voting from April 13 to 29. The results of the preliminary round will be announced on May 3, with the top 16 teams advancing to the semifinals, slated between May 6 and 27. The 16 semifinal videos will be screened periodically on the television channel VTV6 and the fanpage www.facebook.com/diff.vn/ from May 24 to June 17. The four best teams from the semifinals will qualify for the final competition. The final night of the flashmob dance contest will be held at Sun World Danang Wonders on June 29, a week before the final night of the DIFF 2019. In addition to certificates of merit from the VSA Central Committee, the finalists will have the chance to receive one first prize worth VND100 million, one second prize worth VND50 million, two third prizes worth VND30 million each and three fourth prizes worth VND20 million each. Alongside the major prizes, the organising committee will present VND20 million to the team with the most “Likes” on social networks, and another creative prize worth VND20 million.